The start of the 2015-2016 season looked like it was going to be a disaster for Louisville. They opened up the season 0-3, and despite the fact they were going up against some tough opponents, it was extremely worrying. Soon, the Cardinals found offensive consistency and their defense stepped up in a big way, helping them finish off a solid 8-5 that included a Music City Bowl victory over Texas A&M. Louisville now enters this season with a breakout candidate at quarterback, plenty of experience in their backfield and a front seven that could be truly terrifying. It will be tough for them to get over the top in a division that includes Florida State and Clemson, but this year's Cardinals team certainly will not have to endure the rough start they did a year ago. Backfield: Entering last season, the Cardinals had quite the quarterback quandary. 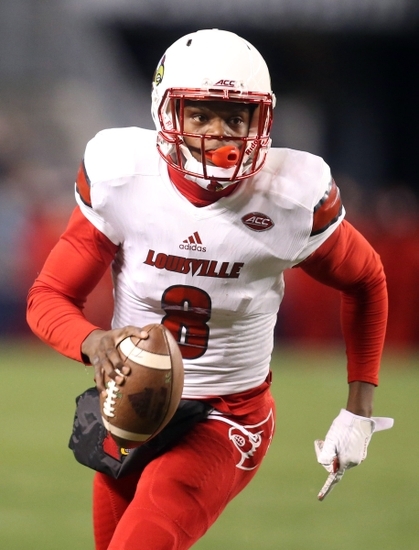 Still reeling without the leadership of NFL prospect Teddy Bridgewater, Louisville was equipped with a number of quarterbacks with some experience, but lacked one that truly took the reigns. By the midway point of the season, however, they had their answer, in an unlikely form. True freshman Lamar Jackson was a long-shot for the job when the season began, but had impressed in short stints of action. He overtook the position and ended the year flaming hot, rushing for over 200 yards and passing for two scores in their bowl win. Jackson's passing stats were not overwhelming; he had 1,840 yards, 12 touchdowns and eight interceptions while completing just around 54 percent of his throws. However, the young quarterback made up for it with his tremendous speed, rushing for 960 yards and 11 touchdowns. Jackson already has looked better as the passer this spring, and it will be interesting to see how Louisville plays with him this season. He should have more confidence and if can grow more comfortable in the offense and become better at pre-snap recognition he could turn into one of the ACC's top overall players, he has that much potential. It wouldn't be too surprising to see Louisville utilize junior Kyle Bolin at QB, as well. Bolin split time with Jackson last season and appeared to be their guy before the freshman really took over. He will have to up his completion percentage from 56% and cut down on his interceptions, but he is a better natural passer than Jackson. The Cardinals' feature back is surely going to be senior Brandon Radcliff, who was productive last season, recording 634 yards and seven touchdowns. Radcliff lacks ideal size, at just 5'9", but still can run through people, and also possesses great vision. Together, him and Jackson could form a dangerous 1-2 punch that defenses will have to gameplan against. Joining Radcliff will be junior Jeremy Smith, another solid back who showed flashes of brilliance in a backup role in 2015. Fellow junior L.J. Scott could also be looked at as a change of pace weapon for head coach Bobby Petrino and new offensive coordinator Lonnie Galloway to use. Another player that will be interesting to watch is junior Reggie Bonnafon. Bonnafon was in the mix for the starting quarterback job last season, and attempted 24 passes a year ago. But, with Bolin and Jackson likely locking down the position, he will most likely have to be used in other ways. He has enough speed to play either running back or receiver or spell Jackson in a "Wildcat"-type formation. Receivers: Helping Jackson continue to grow as a passer will be a steady crop of experienced receivers. The likely No. 1 target for the Cards this season will be senior James Quick, who led the team in receiving a year ago. Quick fits his namesake pretty well; he has great fluid movement and is explosive in the open field. He recorded 39 receptions for 624 yards last year, showcasing his big play potential, with 16 yards per reception. Paired with Jackson's strong arm, Quick could evolve into a very dangerous deep threat this year for Louisville. Joining Quick will be another senior, Jamari Staples, who was also very productive in 2015. Staples also proved to be a dangerous asset down the field, with over 17 yards per catch, but did it a little bit differently than Quick. Instead of being a burner, Staples wields his big frame to make some big plays. He is 6'4" with excellent leaping ability and will challenge even larger defensive backs vertically. Beyond those two, expect the Cardinals to lean on a number of other players looking to step up. Sophomore Jaylen Smith was very good in his debut year in '15, and is still growing. Much like Quick, he should be able to get past defenders with his dazzling speed. Sophomores Traveon Samuel and Devante Peete are two other reserves who will look to grow into more complete receivers this season. Samuel is an explosive weapon that should operate well on short routes and keep the chains moving. Tight end could be a position of strength this season for the Cards, headed by sophomore Micky Crum. Crum had 14 catches for 163 yards and three touchdowns a year ago, and is a proven blocker. He'll be joined by Cole Hikutini, a possible breakout candidate. Hikutini also proved to be a solid receiving threat this past season, landing three touchdowns of his own. He is slightly more explosive than Crum and looked greatly improved in the spring. Expect Galloway to be creative in how he gets these big tight ends the football, particularly in the red zone. The Cardinals have a number of impact freshman who could step in at receiver, if they get the playing time they need. Chris Taylor-Yamanoha hails all the way from the West Coast and is a lethal weapon, while four-star Desmond Fitzpatrick could find a niche. Offensive Line: Also hoping to support Lamar Jackson is the Cardinals' offensive line, which should be pretty solid in 2016, with three starters back. This offensive line should be especially strong at both tackle spots, where they have seasoned veterans. Sophomore Kenny Thomas is expected to lock down the right side of the unit and brings leadership and a gritty mentality. On the other side, another sophomore, Lukayus McNeil is likely going to be tasked with protecting Jackson's blindside. McNeil is a redshirt sophomore who stands at 6'6", 315 pounds. He isn't very athletic, but he uses his size to his advantage and was solid a year ago. The interior of the O-Line isn't quite as strong, but does have a number of players who could adjust to larger roles. Sophomore Geron Christian will compete for snaps at either tackle or at guard. Christian is a solid athlete who can get out and down the field and open up lanes. Junior Kiola Mahoni is another experienced offensive linemen who should fight for opportunities at any number of spots. Overall, the unit is strong and deep on the edges, which fits in well for a Louisville team that should use their great speed to make plays on the edge. Defensive Line: Few players in college football have had the crazy, up-and-down career Devonte Fields has had. Fields was an absolute monster from the moment he stepped on campus at TCU, where he had 53 tackles, 18.5 tackles for loss and ten sacks all the way back in 2012. That great play was enough for him to be named the Big 12 Preseason Defensive Player of the Year as he entered 2013. However, legal issues hit and he was kicked out of TCU and essentially spent two years not playing football before ending up at Louisville. This past season, he was superb and didn't show any indication of rust, with 22 tackles for loss and 10.5 sacks. Despite NFL interest, Fields decided to stay one more year in Louisville and finish off a pretty tumultuous career on a high note. The defensive end has terrific speed off the edge and a nose for the football. He is an established pass rusher, but is underrated in run support. He could very well be the most complete pass rusher in the ACC this year and is a very serious All-American candidate. Fields will be joined by fellow senior DeAngelo Brown on the defensive line. Brown isn't a flashy player but he is as sound of a nose tackle as you will find in the entire nation and proved his ability to be disruptive, with seven tackles for loss a season ago. Brown will have to play an even bigger role this year, with the absence of fellow tackle Sheldon Rankins, whose 58 tackles (13 of them for a loss) and six sacks are off to the NFL. There isn't any clear favorite to take over defensive end duties opposite of Fields. Redshirt junior Johnny Richardson saw very limited action a year ago, with just four tackles. He will be asked to play a much larger role, while three-star Michael Boykin could also give him some competiton. Brown will be helped by a decent amount of depth beyond him at tackle. Junior Chris Williams arrives as three-star prospect from Northwest Mississippi Community College with plenty of upside, while junior Kyle Shortridge will take on a much larger role. Linebackers: Much like the defensive line suffers a pretty big loss in Sheldon Rankins, the linebacker corps will be without one of their leaders, as James Burgess has moved on. Burgess was a long time staple in the heart of Louisville's defense and the Cardinals will not just miss his 90 tackles but his heart and grit. The good news is that their leading tackler, All-ACC Keith Kelsey returns to head the unit. Now a senior, Kelsey is coming off a year in which he was quietly fantastic, with 106 tackles and 11.5 tackles for loss. Kelsey possesses terrific awareness and plays with a ferocity that simply can't be taught. The senior will be a major piece at one of the inside linebacker slots. The other ILB position is up for grabs with the absence of Burgess, but junior Stacy Thomas has all the looks of the favorite. The young but talented 'backer has shown spurts of stardom in shortened action last season (31 total tackles) and in the spring. Thomas can shoot the gap as well as anybody and will be a major help in run support. He has to grow in coverage and is still prone to mistakes, but the tools are there for him to take over Burgess' role and exceed expectations. At outside linebacker, Louisville has good, solid experience with a number of seniors leading the charge. Senior Trevon Young is a terrific pass rusher, with 8.5 sacks to his name in 2015. Young is gifted with good size and long arms, which allow him to get in the quarterbacks' eyes and disrupt plays completely. He also has room to grow, but his mission is pretty clear: get to the quarterback. The Cardinals will also look to junior James Hearns to make some plays at outside linebacker. Hearns didn't get on the field much a year ago, but did prove he had the ability to get to the quarterback, with 2.5 sacks in very limited action. Unfortunately for the Cards, their linebacker corps did take a pretty big hit when senior Keith Brown announced he would transfer. Brown very well could have started at an outside linebacker spot, and offered impressive versatility. His departure means reserves will have to step up and that even young freshman could get some extended action. Three-star prospect P.J. Blue out of Montgomery, Alabama has plenty of potential as a pass rusher and could be used in a variety of ways. 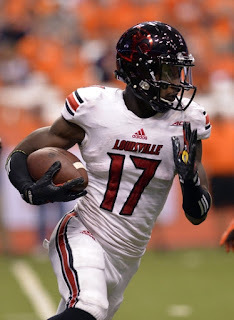 Secondary: Even with the departures of Rankins and Burgess, Louisville will not be an easy team to run on, and they should have a pretty potent pass rush. However, don't expect the pass defense to slouch either, as a number of quality playmakers return throughout the defensive backfield. Cornerback Shaq Wiggins may be the most important, as he will be tasked with taking down the best receivers the ACC has to offer as the team's primary coverage guy. He proved to be pretty disruptive last season, with 11 passes broken up and two interceptions. Wiggins is a tough defender and he proved he could handle speed down the field as well a year ago. Another major returnee to the secondary is safety Josh Harvey-Clemons. Harvey-Clemons may be most remembered for a very unfortunate incident while at Georgia just a few years ago, when he ran into teammate Tray Matthews, which helped Auburn's Ricardo Louis score in the "Prayer at Jordan-Hare." Though, the safety has serious game, proving it 88 tackles last year along with picking off three passes, and he also proved to be a pretty disruptive force overall. Harvey-Clemons has enough versatility to spend time at either safety spot and can roam the field very effectively. He should essentially be the quarterback of the secondary, and the Cardinals will lean on his keen mind and communication. At the other safety position, junior Chucky Williams was a pretty big contributor last season, and should be leaned on for more support. Williams had 61 tackles, also picked off three passes and proved he could lay down the law, with two forced fumbles. Both Williams and Harvey-Clemons give defensive coordinator Todd Grantham plenty of versatility and experience, and they should be leaned on heavily. At the other cornerback spot opposite of Wiggins, another veteran returns in the form of junior Trumaine Washington. Much like the other three, Washington was overall very productive, filing the stat sheet nicely. He had 54 tackles and also had three interceptions, even taking one all the way back to the house. Depth shouldn't be too much of an issue either, with a number of quality reserves set to make their returns. Junior Zykiesis Cannon has had his moments throughout his time with the Cardinals, while redshirt freshman Khane Pass is a possible breakout candidate at either safety slot. Special Teams: Overall, Louisville is a solid team without a ton of notable weaknesses. That excludes special teams, where the Cardinals will be eager to find a new kicker and punter. The kicker competition could be especially interesting, as former walk-on Evan O'Hara will battle with more established redshirt freshman Blanton Creque for lead duties. From top to bottom, Louisville is as solid of a team as you will find in the nation. They possess plenty of playmakers, are strong and bulky in the trenches, and will defend well nearly everywhere. The key could hinge on just how much Lamar Jackson can grow. He is already an established playmaker and he has enough to around him to become a legit Heisman threat. However, can he have success when he squares off with the Clemsons and Florida States of the world? The Cardinals don't have a breezy schedule, with three Top 10 teams that they will have to square off against (Clemson, FSU, Houston) and a number of sneaky ACC foes. While that won't be simple, this team still has the talent up and down their roster to win 10 games and keep themselves above the fray in a complicated ACC race.